Blockchain, the underlying technology for cryptocurrencies such as Bitcoin, has emerged as a secure ledger platform that rapidly will accelerate the adoption of smart city digital services. In the areas of energy and mobility, for instance, blockchain has enabled transactions of everything from solar energy credits to paying drivers and cutting costs for participants in ride-sharing programs by leveraging existing systems — effectively cutting out brokers or third parties. Ford, Silicon Valley stealth startup Autonomic, Qualcomm and Waze announced last month the development of a cloud-based mobility platform for cities to manage self-driving vehicle ride-hailing, deliveries and bicycle sharing that will feature everything from payment processing to parking and traffic logistics. 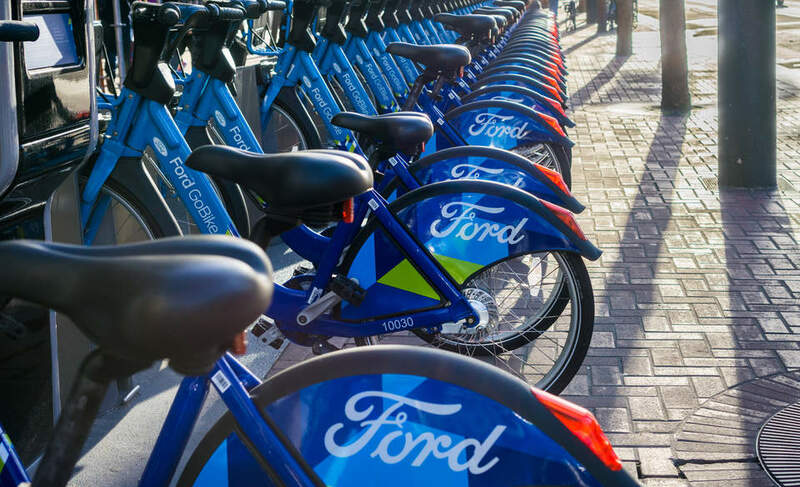 The Ford GoBike share program, which launched in five Bay Area cities in 2016, was said by knowing observers to be part of Ford’s strategy to build a repository of data and usage habits from younger urban shared-mobility users. GoBike was also a means to increase its public-private partner non-auto cred in regional transit planning through work with the San Francisco Bay Area-wide government agency Metropolitan Transportation Commission. In terms of its new urban cloud ecosystem, Ford appears to be trying to avoid the ‘walled garden’ approach of Tesla. Other car companies such as Toyota since early 2017 already have been working with MIT’s Media Lab on their own blockchain-based self-driving vehicle paradigm. The goal is to ensure that software can help advance autonomous technologies through monitoring and distributing vehicle safety information, road mileage and other use data, and through the reduction of fraud. Looking further under the hood, we begin to discover how blockchain will become the lingua francain urban metros. Consider how the Tel-Aviv based ride-sharing company LaZooz is building a decentralized, ride-hailing system that uses blockchain to pay system drivers and to avoid the estimated 10-20 percent or transactional revenue that goes to an Uber, Lyft, or AirBnb for their services. LaZooz envisions others from public, private and non-governmental sectors building apps on top of its technology. In energy, blockchain is also likely to have significant impact through facilitating transactions that bypass gatekeepers such as publicly owned or municipal utilities. In Brooklyn, the start-up LO3worked with Siemens to demonstrate how blockchain can be used as a means to facilitate localized peer-to-peer transactions for PV solar energy credits through an urban microgrid. The Brooklyn Microgrid has a rapidly expanding base of 100 local residents using blockchain to share credits for excess solar energy generated from well-situated local rooftop arrays. In this case, the credits are reinvested in renewable energy and energy storage systems, but at the heart of blockchain value proposition is that such transactions are secure, verifiable and can be used for financial credit in other transactions — instead of having to sell excess energy from solar back to the utility grid under utility purchasing constraints. The fully realized smart city is rapidly taking shape. Forbes recently provided an extensive scenario where, outside of retail purchases, blockchain would be at the juncture of nearly every urban transaction. The scenario showed how each interaction would be transparent, verifiable, and nearly impossible to forge or hack, while adding to the valuable stores of big data on which artificial intelligence can be used by cities and their partners to analyze for future improvements and efficiencies. In effect, blockchain frees interrelated transactional records from being isolated from one another and needing verification, similar to how the internet freed communications and information from bureaucratic silos. The fully realized smart city is rapidly taking shape. Bloomberg New Energy Finance reported an increase in major public-private smart city technology deals to 35 global cities in 2017, up from eight in 2016. Blockchain will further accelerate that progression. Smart cities started in the early 2000’s with broadband and progressed to solution architectures such as LED lighting systems, where digital services using predictive analytics built on the Internet of Things generating big data are becoming prevalent. Now we are entering an era where, thanks to blockchain, there will be a way to keep a running tally on transactions to provide frictionless financial settlements, claim processes, energy generation and so much more.